Lieutenant Colonel (Retired) Ralph R. Hoppe was Chief of the Middle East Intelligence section within the J2 Directorate, USCINCSTRIKE/USCINCMEAFSA at MacDill AFB in Tampa, Florida,when air and sea forces of the Zionist state attacked the USS Liberty, an electromagnetic surveillance ship monitoring the June 1967 Six Day War on an NSA mission. Hoppe reveals in his background paper (below) that analysts in the J2 Directorate agreed unanimously with their counterparts at the Department of State, CIA, DIA and NSA in their independently made conclusions that the attack was deliberate. Then Hoppe saw the cover-up begin before his very eyes, and points to Colonel Anthony Perna as the main suppressor of intelligence indicating a deliberate attack on a US Navy ship. Perna was the US Military Attache at the US Embassy in Tel Aviv, and was "on leave" when he visited Washington and gathered all the evidence brought to the Pentagon with the intention of obstructing justice. Subject: Personal Synopsis of the USS Liberty Incident. 1. On the day of the Israeli attack upon the USS Liberty, June 8, 1967, I was Chief of the Middle East Intelligence section within the J2 Directorate, USCINCSTRIKE/USCINCMEAFSA, located at MacDill AFB, Tampa, Florida. My duties at the time were focused upon the analyses of military/political/economic activities of the belligerents of the 1967 Arab-Israeli Six Day War which had commenced on June 5, 1967. 2. 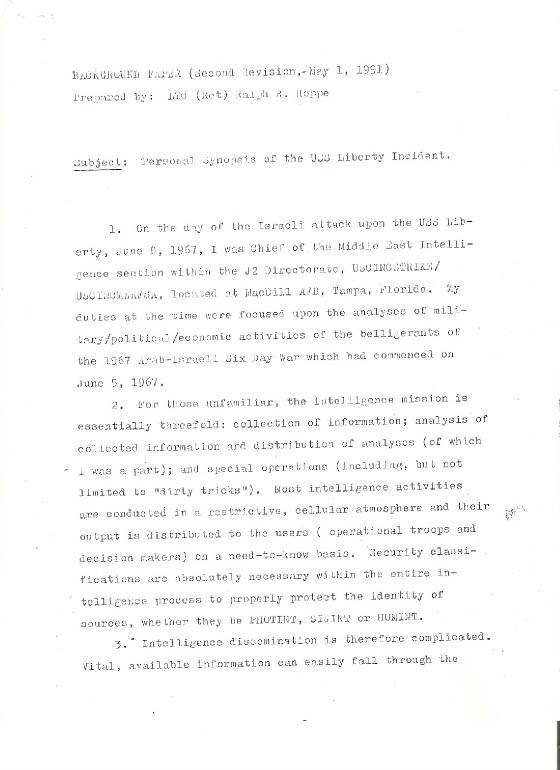 For those unfamiliar, the intelligence mission is essentially threefold: collection of information; analysis of collected information and distribution of analyses (of which I was a part); and special operations (including, but not limited to "dirty tricks"). Most intelligence activities are conducted in a restrictive, cellular atmosphere and their output is distributed to the users (operational troops and decision makers) on a need-to-know basis. Security classifications are absolutely necessary within the entire intelligence process to properly protect the identity of sources, whether they be PHOTINT, SIGINT or HUMINT. a. Dissemination bears many different types of security classifications to properly safeguard a myriad of sources. As most people are aware, the common classifications are CONFIDENTIAL, SECRET and TOP SECRET, each having their own special handling instructions. Higher classifications and/or more restrictive caveats are added to the documents commensurate with increased sensitivity of the sources. b. Many documents contain more than one source. 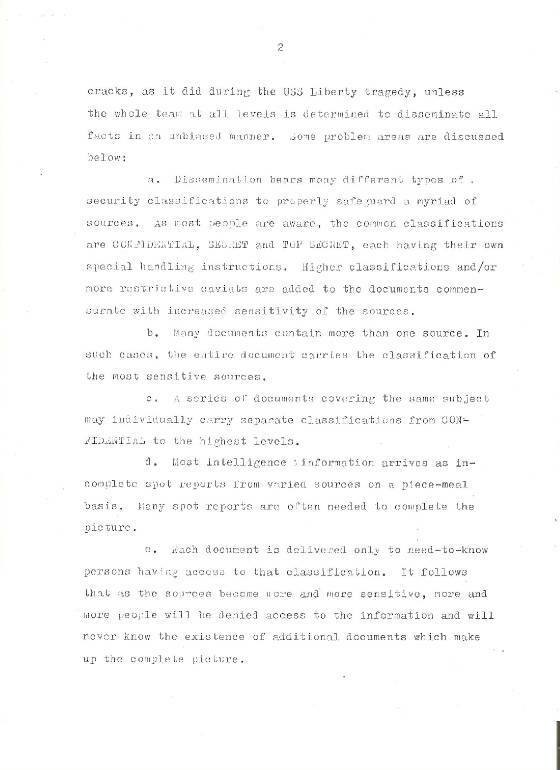 In such cases, the entire document carries the classification of the most sensitive sources. c. A series of documents covering the same subject may individually carry separate classifications from CONFIDENTIAL to the highest levels. d. Most intelligence information arrives as incomplete spot reports from varied sources on a piece-meal basis. Many spot reports are often needed to complete the picture. e. Each document is delivered only to need-to-know persons having access to that classification. It follows that as the sources become more and more sensitive, more and more people will be denied access to the information and will never know the existence of additional documents which make up the complete picture. 4. Israel won a major victory over the Arabs in the 1967 War. Hostilities had been preceded by Arab threats, Egyptian closure of the Straits of Tiran, mobilization by both sides, and pull-out of UN peacekeeping forces. On June 5, 1967, Israel initiated hostilities (verified by US intelligence) by invading the Sinai with ground forces and attacking airfields in the Sinai and elsewhere within Egypt. By the time a ceasefire had been agreed upon at the end of 6 days, israel had seized and occupied the entire Sinai peninsula up to the Suez Canal, the Gaza Strip, the West Bank and Jerusalem, and Syria's Golan Heights. (The reader is reminded that these seized territories, with the exception of the Sinai, had been claimed publicly in 1948 by leading Zionist leaders – including later-to-become prime ministers Menachem Begin and Yitzhak Shamir – as rightful parts of reconstructed eretz Israel, the Zionist historical homeland.) 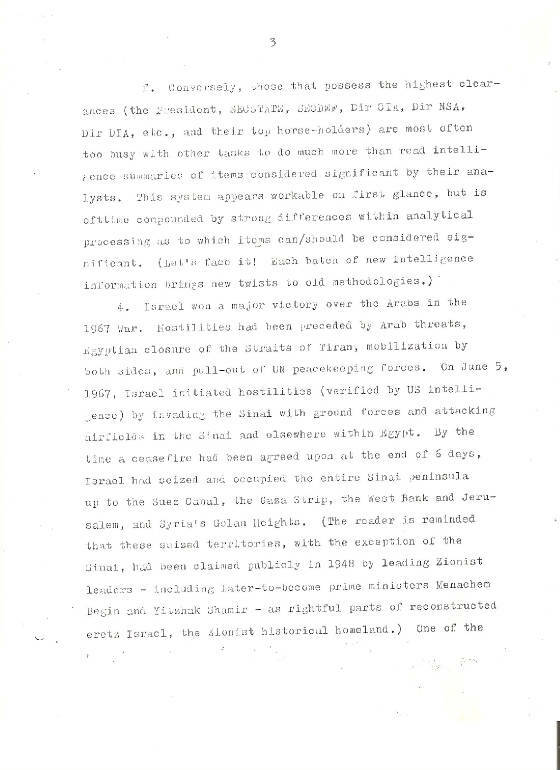 One of the more interesting Israeli versions of the Liberty incident (inferring that secretive U.S./Israeli agreement had been seriously bungled by both sides) was written by Chaim Herzog (The Arab-Israeli Wars, Random House, N.Y., 1982). 5. Prior to the commencement of hostilities, President Johnson and SECSTATE Rusk openly pleaded with Israel to refrain from executing a preemptive strike; following the Israeli attack, the U.S. continued to openly press for an early cease-fire and separation of opposing forces. Israel, winning handily from the start, paid lip-service to wanting an early end to hostilities, but it's clandestine, accelerated military movements left no doubt to U.S. intelligence that the Israelis weren't about ready to stop until they had achieved their planned objectives (which clearly coincided with the territories which they seized before accepting the cease-fire). Upset with the Israeli deceit (or bungling previous secretive agreement), the U.S. increased its intelligence collection of Israeli activities. The Israelis immediately objected to the U.S. action. 6. The USS Liberty was moved into the eastern Mediterranean to monitor both Arab and Israeli military activity. 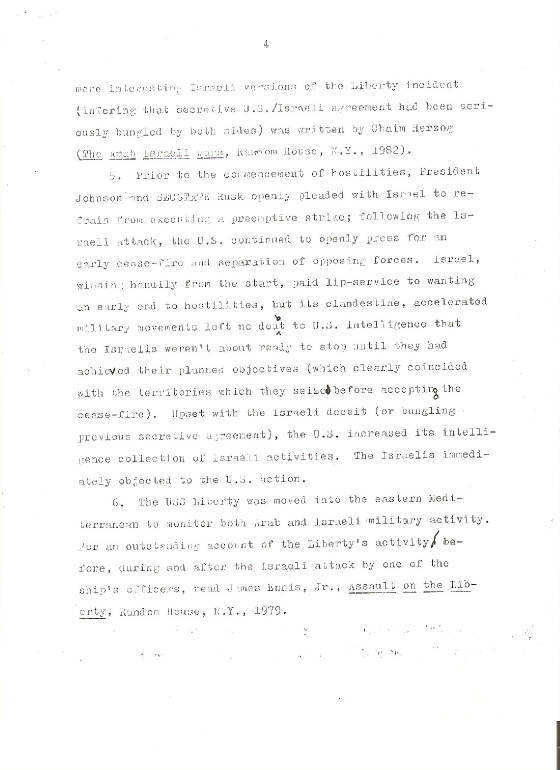 For an outstanding account of the Liberty's activity before, during and after the Israeli attack by one of the ship's officers, read James Ennes, Jr., Assault on the Liberty, Random House, N.Y., 1979. 7. As the Liberty approached Israeli shores, Israeli Defense and Foreign ministries began pressuring the U.S. Embassy in Tel Aviv to ascertain whether it was an American ship and, if so, to determine why was there and what was its mission. According to Israeli reports covered in the press, the U.S. Embassy initially pleaded ignorance to the ship's arrival, but promised that they were making every effort to get an answer. (Most U.S. State Dept reports of that series of dialogues which I saw at the time were never divulged to the press, but certainly are available in permanent files and could settle the argument if the U.S. ever agreed to release them.) The longer the U.S. delayed, the harder the Israelis pressed for an answer. About 24 hours before the attack against the Liberty, the exasperated Israelis reportedly informed the U.S. Embassy that lacking any positive answers from the U.S. they could only assume that it was a belligerent ship which is fair game under the rules of warfare. 8. 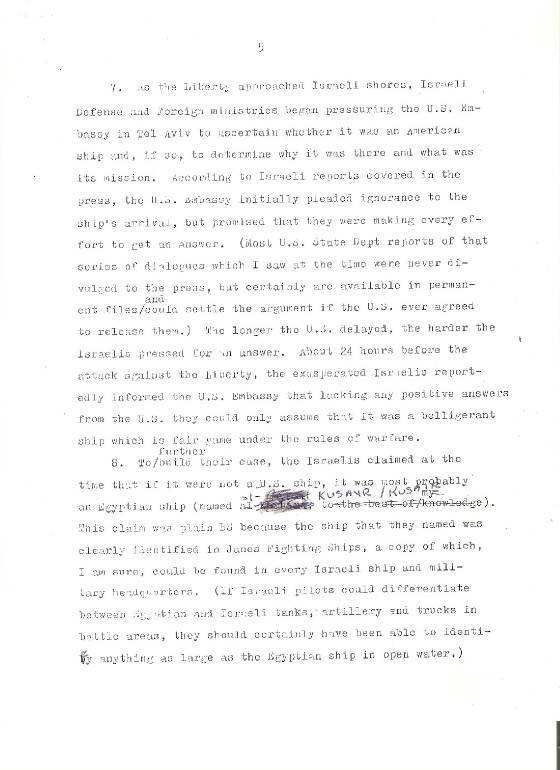 To further build their case, the Israelis claimed at the time that if it were not a U.S. ship, it was most probably an Egyptian ship (named al Kusayr/Kusair). This claim was plain BS because the ship that they named was clearly identified in Janes Fighting Ships, a copy of which, I am sure, could be found in every Israeli ship and military headquarters. (If Israeli pilots could differentiate between Egyptian and Israeli tanks, artillery and trucks in battle areas, they should certainly have been able to identify anything as large as the Egyptian ship in open water.) Moreover, the configuration of the named Egyptian ship was considerably different from that of the USS Liberty. 9. Two first-rate analysts from our (STRIKE) intelligence section sensed quickly from in-coming reports that the attack upon the Liberty was deliberate. 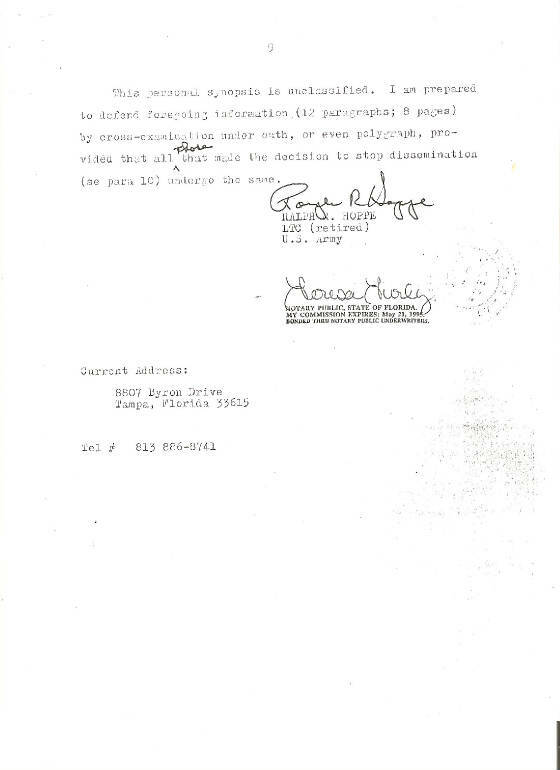 (One of the analysts was an AF major, whose name I have forgotten, but which could be obtained from official records. The other was an Army captain, William Kirby, who shortly thereafter transferred administratively from the Army to the Dept of State. The last time I saw Kirby was September, 1974, in Tel Aviv, where he was assigned to the U.S. Embassy.) 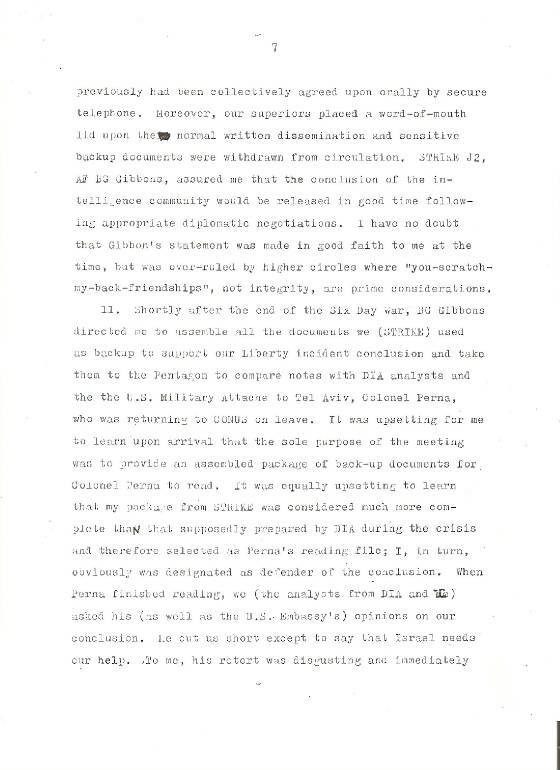 We immediately contacted the U.S. analytical intelligence community in Washington D.C. (State, CIA, NSA and DIA) individually by secure telephone to get a consensus on our conclusion and were pleased to find that the community's analytical personnel (our counterparts) unanimously agreed that the Israeli attack was deliberate, not accidental. 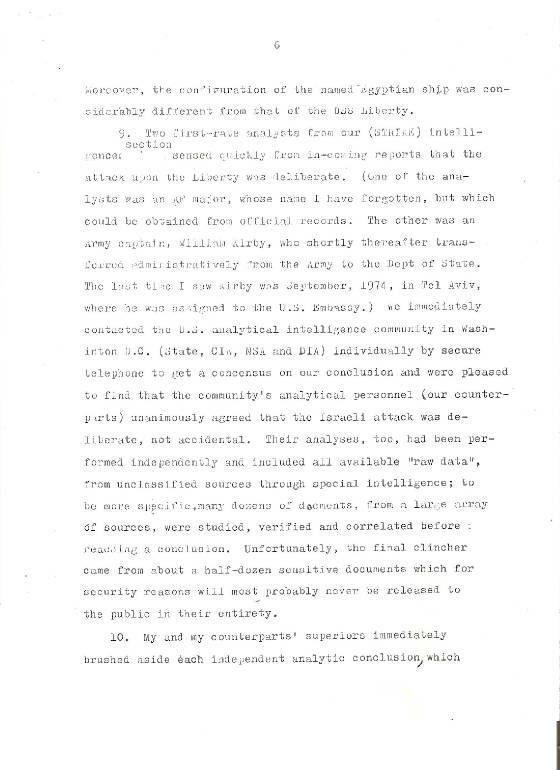 Their analyses, too, had been performed independently and included all available "raw data", from unclassified sources through special intelligence; to be more specific, many dozens of documents, from a large array of sources, were studied, verified and correlated before reaching a conclusion. Unfortunately, the final clincher came from about a half-dozen sensitive documents which for security reasons will most probably never be released to the public in their entirety. 10. My and my counterparts' superiors immediately brushed aside each independent analytic conclusion, which previously had been collectively agreed upon orally by secure telephone. Moreover, our superiors placed a word-of-mouth lid upon the normal written dissemination and sensitive backup documents were withdrawn from circulation. STRIKE J2, AF BG Gibbons, assured me that the conclusion of the intelligence community would be released in good time following appropriate diplomatic negotiations. I have no doubt that Gibbons' statement was made in good faith to me at the time, but was over-ruled by higher circles where "you-scratch-my-back-friendships", not integrity, are prime considerations. 12. I was pleased to hear that several governmental agencies decided to undertake hearings, but I wrote them off as a "whitewash" as soon as I learned that none of the senior intelligence analysts within the Washington, D.C., area had been called to appear for questioning; yet, their top bosses, the ones who had brushed aside the analytical opinions, were called because they possessed knowledge of "all the details". Concurrently, all the information provided by the Israelis appears to have been accepted as fact without cross-examination under oath. 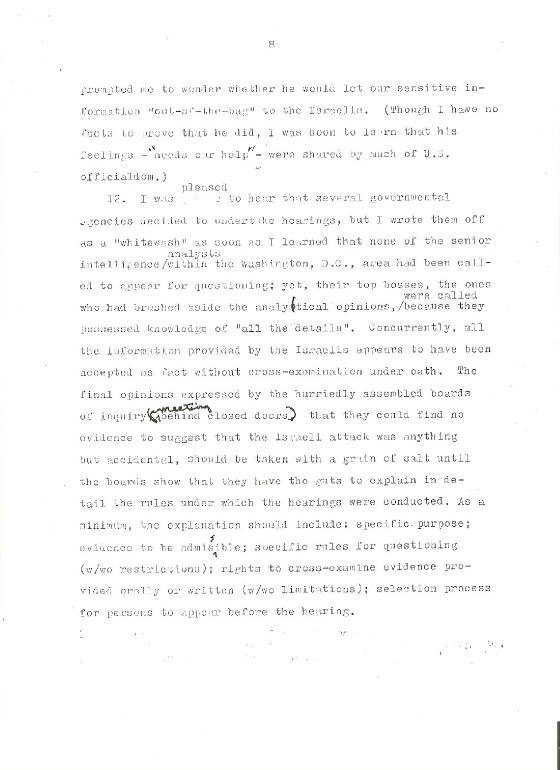 The final opinions expressed by the hurriedly assembled boards of inquiry (meeting behind closed doors) that they could find no evidence to suggest that the Israeli attack was anything but accidental, should be taken with a grain of salt until the boards show that they have the guts to explain in detail the rules under which the hearings were conducted. As a minimum, the explanation should include: specific purpose; evidence to be admissible; specific rules for questioning (w/wo restrictions); rights to cross-examine evidence provided orally or written (w/wo restrictions); the selection process for persons to appear before the hearing. This personal synopsis is unclassified. I am prepared to defend foregoing information (12 paragraphs; 8 pages) by cross-examination under oath, or even polygraph, provided that all those that made the decision to stop dissemination (see para 10) undergo the same.